along the banks of the Schuylkill River. with a properly exposed museum. along Martin Luther King Dr.
in order to get the reflection. with the cute but terribly impractical shoes I was wearing. At least they weren't heels! what a girl's gotta do. Your "supermoon" was much bigger then the one we saw here in South Europe. That image is fantastic. Thanks for the behind the scenes info on the creation of the shot. It really turned out amazing! STUNNING!! The museum is just a stunning backdrop for this! Still can't get used to the former West River Drive being renamed! This is just beautiful!!! I LOVE IT! 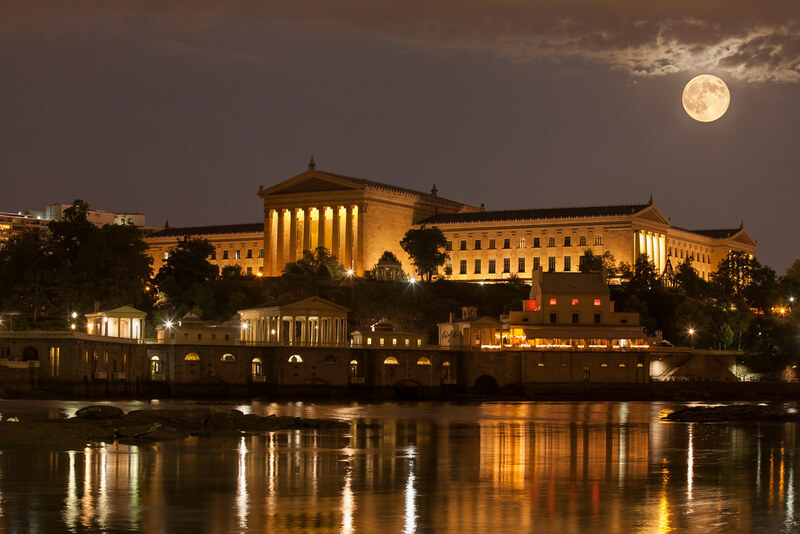 The museum is one of my favorite places in the world - growing up near Philly I have many stories and memories of trips there and even more drive by and walk by sightings! With the moon like that - well, beyond romantic! Nice job and thanks for the bracketing tip. I'm not sure I would have wanted to climb down that hill during the day, let alone in the dark. WOW - I knew the Super Moon was supposed to be out last night but completely forgot - ugh! This picture is fabulous. What a marvellous shot! Sadly it was damp and cloudy here.